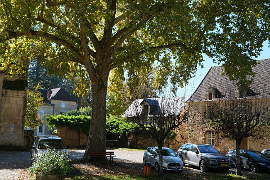 St Leon sur Vezere is in the Vezere valley between Montignac and Les Eyzies. 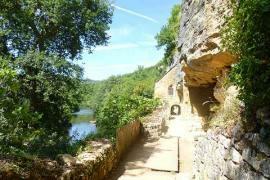 It is a beautiful village, set in a curve in the Vézere River. It is a small village, of houses in the attractive local stone joined by narrow meandering pathways and alleys. 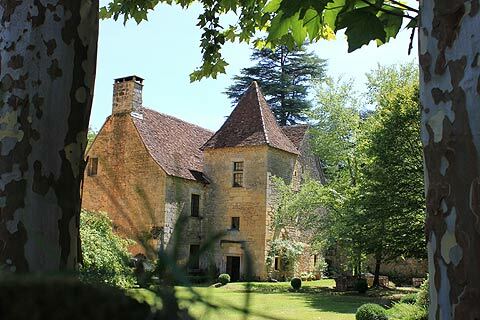 Remarkably for a village of this kind in this location, St Leon sue Vezere has not been overly renovated - rather 'sympathetically restored'. 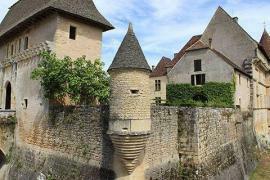 Many of the houses still have parts of their roofs made of stone which was the traditional roofing at one time. The church in the village is small but perfectly formed. The church in St Leon sur Vezere is on the site of an ancient Gallo-Roman villa and you can see some traces of these on the side of the church next to the river. 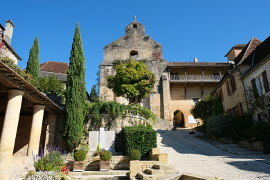 It is on the pilgrim route that led from the Abbey of Vezelay in Burgundy and on towards the abbeys at Cadouin and Saint-Avit-Senieur. Around Le-Bugue the paths lead to various attractive churches including this one at Saint-Leon-sur-Vezere. Beautiful on the outside with its lauze (stone) roofs and round sections as well as its lovely square bell-tower with lots of arched openings. 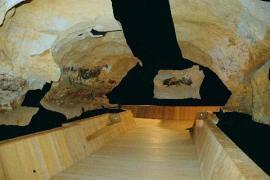 Make sure you also look inside as the round domed ceiling also has the remains of some lovley frescoes. 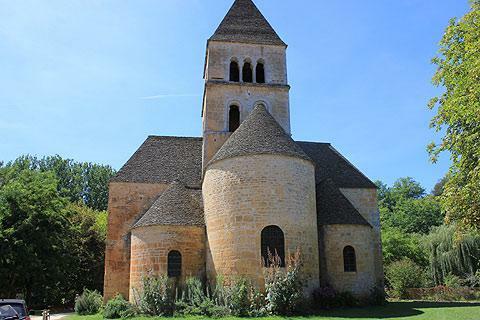 The church is one of the oldest roman-style churches in the Dordogne area, dating back to the 12th century. The church sits on the riverbank where there are beaches and grassy areas as well as a few picnic benches. Stroll along the riverside a little way to get some of the best views of the castle. The chateau de Clerans has a beautiful slate roof with spires and ornamental stone work. It is private but very attractive and can be seen from various points around the village as well as from the riverside path. 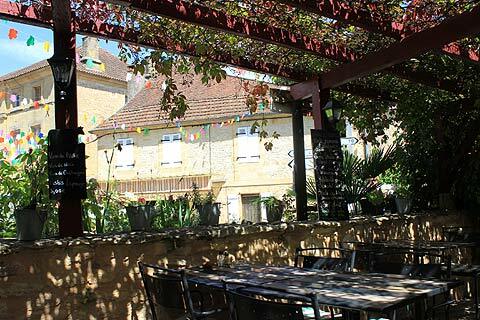 You will find a couple of cafes and restaurants in the centre of the village plus a little cafe hidden away on the edge of the river, but few other facilities or gift shops. There is an interesting legend in the village that a servant who shot an arrow at the cross fell down dead with his head turned the wrong way round. His grave was opened in 1890 by members of the Archealogical society and indeed there was a body with a head which was back to front. 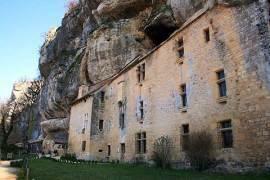 Saint Leon sur Vezere is listed as one of the 'most beautiful villages of France'. 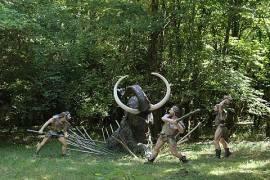 The Vezere Valley itself is, of course, the cradle of civilisation in Europe, so there are a large number of caves and prehistoric dwellings to explore in the region. 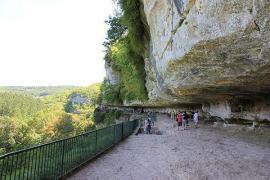 - not least, the renowned Lascaux II Caves which are close by at Montignac (see Dordogne caves section).